This Retreat is Full. Please contact us to be placed on a wait list. This Silent Meditation, Breathwork and Yoga retreat offers an opportunity to experience our True Nature. The underlying purpose of Yoga and most other spiritual traditions throughout the ages is to help us inquire into who we really are beneath the many layers of conditioning and to live our life from That. Various names have been used to describe our True Nature – Spirit, Life Force, God, Awareness, Soul, Atman, Buddha Nature, Love, Self, etc The name is not important. In fact who and what we are is beyond description and can not be adequately named. In stillness we can inquire into who we are beyond a “me” – beyond our name, roles, various self-concepts. We can notice what it is that actually feels, sees, hears, smells and tastes. We can notice what arises and passes away and what never changes. This is our True Nature. It is always here in each moment and is the source of Joy and the source of everything manifest. Through the practices of meditation, breath work, yoga asana, yin yoga, pranayama, meditative movement, breath work, yoga nidra, restorative poses, self-inquiry, silence and free time in the natural world we will explore and discover for ourselves our True Nature. This retreat is designed for those people willing to let go of the past and step into the vast Unknown, the only place that true transformation can occur. The various practices offered will not always follow conventional, currently popular practices of yoga and meditation. Participants should be prepared to explore various innovative and novel means of moving energy in the body/mind in order to increase their capacity for greater levels of awareness that exist beyond their conditioned and limited self. Breathwork is primarily an experience of yourself in relation to your inner landscapes and the innate healing ability of your own breath and your own psyche. For further information about Breathwork click here and here. This three-night meditation, breathwork and yoga retreat begins with evening meal at 6pm on Thursday, July 11 and ends at about mid-morning on Sunday, July 14 after a morning session and a late breakfast. This retreat is for those seriously committed to the work of self-transformation. It is not a spa or vacation. The use of electronic devices is prohibited. Participants must place their cell phones and electronic devices in the retreat office the first night of the retreat and remain at the facility for the duration of the retreat. 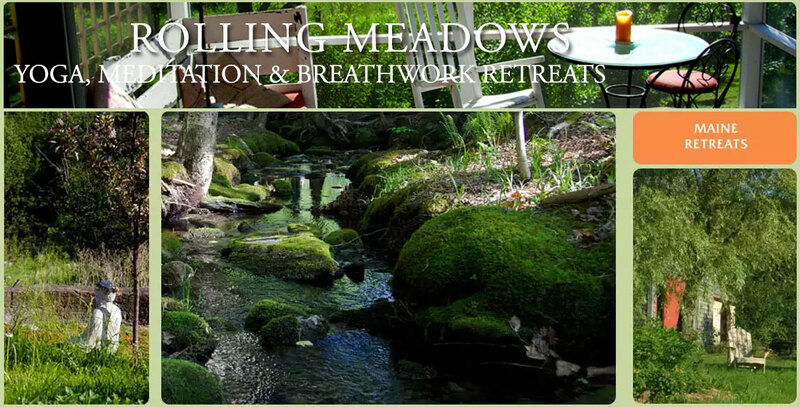 Rolling Meadows yoga and meditation retreat is described here click here. For a page with information on “Why go on Retreat” clic here. The the cost for the retreat is $725.